But what we call our despair is often only the painful eagerness of unfed hope. Gold and precious metals in general had a spectacular run from 2003-2011, and it was around that time we published our first article on Gold-eagle. At that period, we were pounding the table on Gold, Silver and the entire precious metal’s sector. Is this the end? Is this monstrous bull dead? We have stated repeatedly, that every major bull market has to experience one back-breaking correction… Usually the correction ends with a 50% pullback from the highs, which would translate to a low of roughly $960.00. Apparently, Jim Rogers holds a similar view. Gold is in a correction, and the correction has gone on for four years,” Rogers said. “Although I am not buying gold, I am expecting an opportunity to buy gold sometime in the next year or two. For instance, if gold goes under $1,000, I hope I’m smart enough to buy a lot more gold. For the past two years until April or so of this year, Gold bugs abruptly found faith, and when you find religion in an area that does not merit or warrant it, the result is always dire. Against the backdrop of trillions of new dollars being created every year, how could Gold put in a top, and to make matters worse pullback so strongly? Unable to find a plausible answer, they started to chant kumbaya or look at tea leaves or anything that might offer a reason for this back-breaking correction. Prayers, magical incantations, etc. Are always answered, but instead of reward, the retort meted out is usually further melancholy and anguish. Based on these development we stated several months ago that we could expect Gold to trade even lower. Again, Jim Rogers appears to concur. “There are still too many mystics in the gold market who think gold is holy so cannot decline. When/if they give up and throw their gold out the window because ‘she lied to me,’ gold will make a firm bottom,” Rogers said. Now that Gold has traded below $1100, religion is being abandoned, and the wailing and gnashing of teeth phase is taking hold; all their prayers have gone unanswered and hopelessness is setting in. They cannot fathom how with trillions of more dollars being printed, Gold instead of soaring continues to get hammered. Again, we need to repeat the phrase we recently used…….. “Welcome to my lair said the spider to the fly… to which the fly responded which one”… We have two worlds coexisting together, the illusory and the real. The masses (crowd) have embraced the illusory, so the illusory supersedes reality for now, and this is what the Gold bugs do not fathom. The masses actually believe money is created from trees in contrast to sweat and labour, and so until they think otherwise, the Fed can continue running the press, and the masses will be none the wiser. They have not yet grasped the true meaning “Fiat money.” The assumption is that these worthless pieces of paper-backed by nothing are worth their weight in Gold. The masses will be none the wiser, but you can; Gold is not going to drop to zero, not in the face of the largest currency war the world has ever witnessed. We have spoken of this war in the past and termed it the “race to the bottom”. Every nation is actively looking for a means to debase its currency to maintain its competitive edge. The Chinese have decided to join the currency war and stunned the markets by devaluing their currency twice in two days. We warned of these coming currency wars as early as 2003. This is a signal to the USA that they can also play the same game. As we like to say it takes one to cry, two to tango and three to have a party. China has now actively joined the currency wars, and the battle is going to pick up in intensity from here. We expect a host of nations to follow suit. Vietnam has already joined the bandwagon, and devalued it currency twice to maintain its competitiveness. Indonesia has been allowing its rupiah to literally collapse since Jokowi took power. From a low of 11,500 to the dollar, it is currently trading a 13,800. Do you really think as these currency wars pick up in intensity, gold will continue to plunge? For the trader or investor who was paying attention Gold issued several signals that a top was close at hand; the two major signals were issued in the second half of 2011 and towards the end of 2012. There was ample time to take some money off the table or hedge one’s position; one should never try to get out at the exact top or try to get in at the exact bottom. Besides being something that is almost impossible to achieve, it’s a process that is fraught with pain and misery. Gold has violated its long-term uptrend line, and this automatically indicates that the bottoming phase is going to be rather volatile and frustrating. The above chart is a chart of the Gold ETF (GLD), but it mimics Gold relatively well give or take a few points; this is of no importance as we are focusing on the big picture. 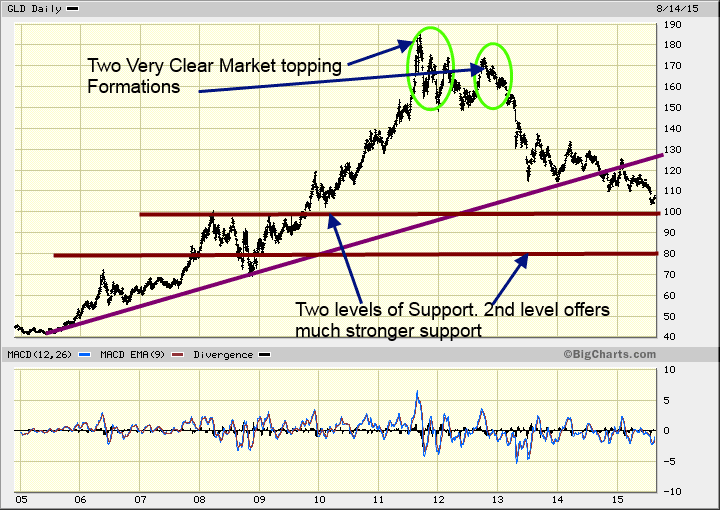 The first level of support kicks in at 100, which correlates roughly to $1000 for Gold. A weekly close below this level will most likely result in Gold testing the $960 ranges. A test or a break of $1000 should be viewed as a mouth-watering opportunity to load up on this precious metal. In this age of extremely volatility, there is always chance that Gold could overshoot; by the same token, it could refuse to buckle and trade down to the $960 ranges. Don’t fixate on absolute prices; if its bargain jump in and buy, instead of trying to save a penny and losing a pound. The astute investor will use this phase to build up and add to his or her position, instead of complaining. Only imbeciles complain, and then turn around and state that they would have done things differently given the opportunity…. The reality being that they will never change and will always react in the same way. This is the advice we offered our subscribers recently. We could list a plethora of factoids (fundamental data) as to why Gold should soar. Every Gold analyst and every Gold bug expert over the past five years has done this repeatedly, and all to no avail. We are not going to recite what you can easily find on the net by conducting a simple search. The trend is your friend, and everything else is your foe. The sentiment readings right now are conducive to market bottoming action; however, the technical outlook indicates that there could be more downside. Our trading methodology focuses extensively on mass psychology and technical analysis. From the mass psychology perspective, Gold is very close to putting in a bottom. Sentiment investors, contrarian investors and investors who are familiar with the concept of mass psychology should consider taking a closer look at the precious metal’s sector now. From the Technical analysis perspective, the potential for more downsides is still there as our reliable trend indicator has not turned bullish yet. However, we have been advising our subscribers to deploy small amounts of money into Gold because we sold close to the top, and so we are using profits to get back in. Incidentally, we did warn our subscribers to close the bulk of their positions in Gold, Silver and their entire Palladium bullion position around August of 2011. Just for the record, selling close to the top was not something we were attempting and attribute that more to lady luck than anything else. Even though this phenomena has occurred before, we will always attribute it to lady luck; as noted before, trying to predict the top or bottom is a task best reserved for fools with plenty of time on their hands. We look for bottoming or topping action and for change in the direction of the trend. If we were establishing positions for the first time we might have been a bit more conservative. This appears to be Jim Roger’s current stance. In terms of the way the markets are leveraged today, there is no guarantee that you will find the exact bottom; looking for the precise bottom is like trying to find a needle in a mound of cow dung; a nasty and stinky process where the odds of success are rather low. If you liked Gold at $1800 or $1600 or even $1200, you must love the fact that it is now trading at $1100. Do not mimic the crowd (mass mindset), whose sole function is to sell when its time to buy, and buy when its time sell. These people always make the following statement “I wish I bought when the markets were falling apart,” but when that situation finally presents itself, these very same individuals are the first to head for the exit. From a mass psychology and trading perspective, a bottom is not too far in the makings. Sentiment readings are bearish; Gold bugs are in despair, and even many contrarian investors are not sure of their footing anymore. All this bodes well for the precious metal’s sector in the long run. From the Technical analysis perspective, gold has one more leg down, but the last leg might or might not be too steep. 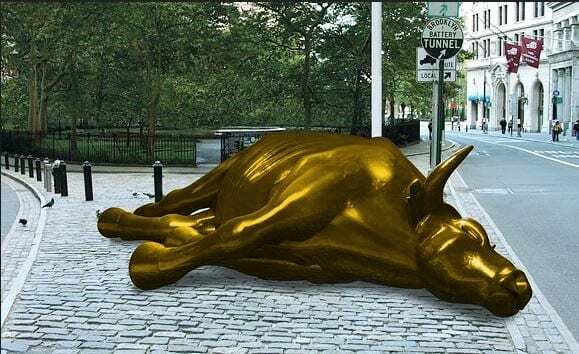 It will serve to bolster the foolish notion that the Gold bull is dead. Every bull market undergoes a back-breaking correction, and Gold is no exception. We believe the next leg up will yield even larger profits. There are some Market technicians and analysts offering lofty targets of $10,000, $15,000 and even past $20,000. While we are at, why not suggest $100,000. We are sure someone will come out and issue such a silly target. This begs the following question: How many generations would have to pass for those targets to be hit. Why the focus on such lofty targets when Gold has not even traded to $2000. Our targets issued years ago still stand. Our first target of 1500-1800 has been hit. The next stage is for Gold to trade to $2000; once 2,000 is taken the next phase of the true bull will begin. Our high target is in the $5000-$5500 ranges, with a possible overshoot to $6,000. And that is all we have to say on this topic. The focus now should be making sure you are in the market and not jabbering about how high Gold will trade. As the saying goes “you need to be in it to win it” The trend is your friend; everything else is your foe.